« Eric Idle (and friend) offer an antidote to magical thinking. I’ve been thinking this week about a factoid I picked up hearing about the new book by Drew Gilpin Faust, Civil War historian and newly installed president of Harvard. It’s a book about the dead, about sorrow and loss, and one of its baseline number is the raw total of Civil War dead from both North and South — 620,000. But what struck me in the coverage of the books was something that should have been obvious: that number could be expressed a different way: not as an absolute total, but as a percentage, a ratio: 2% of the population of the warring parties, one person in every fifty, taken by bullets, cannon fire, bayonets or disease. World War I cost almost 20 million out of a total population of 933 million in the nations involved — a loss just over 2 %. Germany and France each lost an astonishing 4% each in the war. That kind of loss, that proportion, goes a long way to accounting for the sorrows to come: Clemenceau’s demand for revenge through the Treaty of Versailles; Germany’s bitter resentment and almost immediate covert rearmament after the terms of the Treaty became known…and so on. The threads that lead from World War I to II are much more complicated than that cartoon, but still, it is clear that such levels of loss have a profound, almost morally paralyzing impact. On to Iraq. The US Department of Defense as a matter of policy does not estimate Iraqi civilian deaths, and there is no single authoritative Iraqi government tally. But numbers are finally coming in. A study published in 2006 by a Johns Hopkins team estimated that there were 601,000 deaths due to violence since 2003. (Click the link for an overview of both the research and its critics.) Last week, a new WHO study offered lower estimate of not less than 151,000 Iraqis lost to violence since 2003 — with additional non-violent “excess” deaths to be considered. The next step is obvious, I’m sure. According to the CIA, Iraq’s population is 27.5 million. 2 % of the total comes to 550,000 men, women and children. If the Johns Hopkins team is right, Iraq has long since left that dreadful marker behind it. Accept the WHO estimate, factor in the non-violent excess deaths (as the Civil War and World War I figures do), then the application of one of the oldest, simplest — and most powerful — analytical tools of the scientific mind reveals the grim reality: 2% going, perhaps gone; more dying. Either way, the memory — still — of the Civil War; the experience — still! — of standing in silence for the church bells across England on the eleventh hour of the eleventh month of every year, tells us why the proportion of loss Iraq now endures is so important to understanding the fate of US policy there. A quick digression: Transforming individual data points — observations — into abstractions that permit these kinds of comparison is, of course, the central act of scientific thinking. One of the reasons, perhaps the reason to make sure our culture values not just scientific discovery, but scientific habits of mind, is so that we can use even (or especially) the simplest of its tools to get a handle on what is happening around us. And back on the ground: I deeply hope Iraq emerges into a real civic life in less time than it took the US to recover from its fratricidal war. But I look at the hard logic of that 2 % and I know that talk of an American “victory” in Iraq is hollow posturing. We just don’t know yet the manner and depth of the failure to be endured. Update: Yoram Gat at Pro Bono Statistics has an excellent post that analyzes the discrepancy between the Johns Hopkins study and the more recent WHO report in their Iraqi death totals. Short form: when you look at the concept of excess deaths, the two studies agree much more closely than if you look at the category of deaths by violence. But do read the whole thing. It lays out the argument clearly and dispassionately. Also check out Gat’s explicit critique of the WHO study (the IFHS study, in his telling). His analysis leads him to conclude that the new study is not obviously methodologically superior, and may be inferior to the earlier one. None of this alters my basic point above. Both studies confirm that a huge number of Iraqis have died either directly or indirectly from the violence unleashed by the US decision to go to war in Iraq. That number is big enough to compare with exceptionally destructive bloodlettings in the past. The consequences of those earlier losses reverberated for decades or more. I see no reason to believe that the Iraqi experience will be any different. 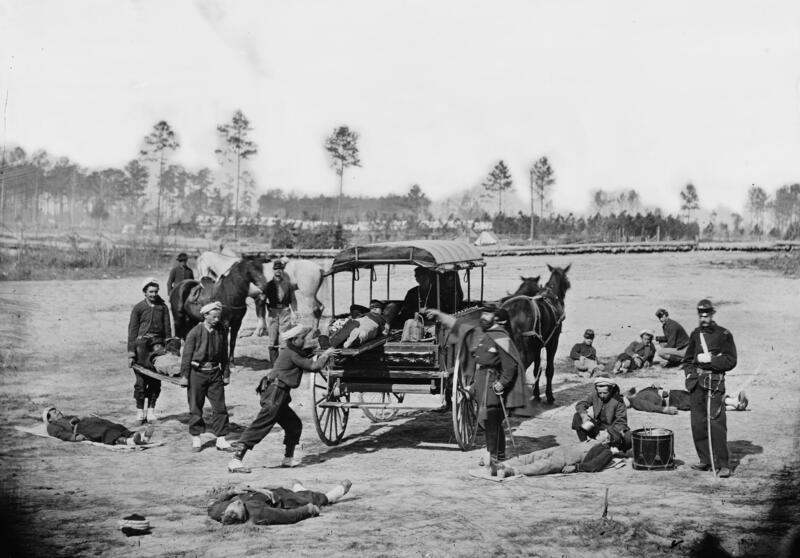 Image: American Zoave ambulance crew demonstrating the removal of wounded from a battlefield, c. 1862-65. Library of Congress. Source: Wikipedia Commons. This entry was posted on January 14, 2008 at 11:46 pm and is filed under Iraq, War. You can subscribe via RSS 2.0 feed to this post's comments. You can comment below, or link to this permanent URL from your own site. This is the kind of context that the MSM ordinarily misses. Thanks! Thanks for visiting and for the nice words, Thomas. This is a fascinating study … but you may also wish to examine the results of World War I and ITS catastrophic end in the Treaty of Versailles, in which case … DO have a look at my wonderful new book … “A Shattered Peace: Versailles 1919 and the Price We Pay Today” [ http://www.ashatteredpeace.com ] just out from Wiley and available at Amazon and most major bookstores ! The reason this is so important is that if you were to randomly distribute those 2% deaths ( an admittedly crude approximation) and assume that in a extended family culture every person has at least 10 people to whom they feel very close, then you have something like 80 % of the population with a major grief and grievance. Then put these people in close proximity to those they consider the perpetrators and you create a society of permanent vendetta. Just stepping in to note that I fully agree with David on the significance of Versailles in the formation of lasting enmity after World War I, (and his “A Shattered Peace” has been on my to-read list since it came out for just that reason). I’d argue that the revanchist position of the French at the Conference derived directly from the scale of destruction they had endured – which is the point of the post above. But there is no doubt, as David’s book documents very well, that a great deal of the woe we have endured over the last 90 years can trace at least some of its roots back to that miserable exercise outside Paris in 1919. LL and Yoram — you are both more than welcome. Thanks for stopping by.